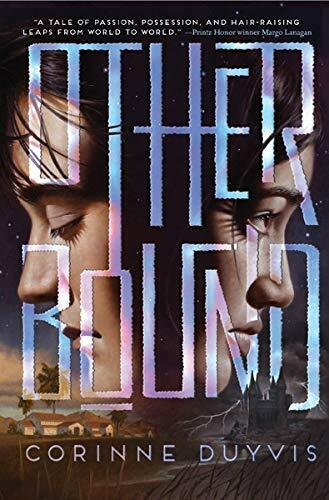 I picked up Otherbound by Corinne Duyvis because it had the most fascinating sounding premise: every time Nolan closes his eyes, even to blink, his consciousness flashes to another body in another world. Which makes life for him extremely challenging! Nolan is a teenage boy living in our own world, but every time his eyes close, he’s in the body of Amara, a teenage girl who lives in a very different world full of magic and danger. Amara and her companions are on the run from hostile magicians, guarding the princess of a deposed monarchy. Princess Cilla is cursed: if she bleeds even a drop, the blood triggers the curse and the world–rocks, grass, anything nearby–will attack her. Amara has the ability to heal herself, so it’s her job to take the brunt of the attack until the magic loses track of Cilla’s blood, distracted by Amara’s. So not only is Nolan dealing with distracting flashes of another life, it’s often a very painful life. Amara doesn’t know anything about him…until he discovers a way to take control. This is one of those books that both benefited and suffered from a really amazing premise. It’s told in alternating chapters from Nolan’s and Amara’s points of view. I was fascinated by Nolan’s experience, of how he can possibly cope (answer: not very well) when closing his eyes takes him into another life. He’s been diagnosed with epilepsy, and feels constantly distracted and unable to focus, straining his relationships with his parents and younger sister. School, as you might imagine, is quite the struggle. All of that was really sad and interesting–to the point that I was less interested in Amara’s experience, even though the bulk of the plot is in her world. And it was a perfectly good fantasy plot with some clever twists and complex characters…just not grabbing me quite the way Nolan’s experience was. I also didn’t anticipate how bloody this would be. With a main character who can heal herself, that left the author free to put Amara (and by mind-link, Nolan) through a lot of severe injury, and she doesn’t pull punches on the description. So, be warned on that! I first encountered this book looking for reads for my diversity challenge, and it fulfilled that one for sure. Nolan is Hispanic with some Aztec ancestry; I could never quite figure out if Amara was a fantasy-analogue for a particular real-world ethnicity (though Cilla is described as dark-skinned) but it is clear multiple ethnicities are interacting in her world. I was mostly looking for ethnic diversity, but Amara is also bisexual and mute. Nolan, besides his epilepsy diagnosis, also has a prosthetic leg (product of a car accident while he was flashing to Amara’s world). So–lots of non-typical-protagonist traits! This was a really interesting book and I would recommend it…although I just wanted to love it a little more than I actually did.